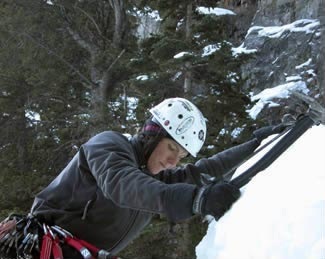 American Alpine Institute - Climbing Blog: AAI Guide Dawn Glanc appears on The Weather Channel's "Epic Conditions"
AAI Guide Dawn Glanc appears on The Weather Channel's "Epic Conditions"
Dawn Glanc climbs in Ouray, CO.
Last week, our very own Dawn Glanc appeared on the weekly TV show called "Epic Conditions". This show plays weeknights on The Weather Channel at 7pm and 11pm ET. Epic Conditions "looks at the dynamics between perfect weather conditions and perfect location to create the ultimate extreme sports adventure." Dawn in Ouray on the route known as "The Good Looking One." 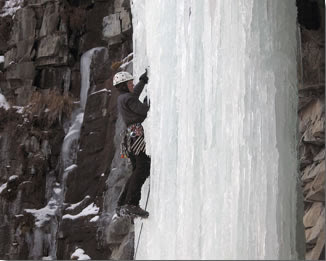 You can catch glimpses of Dawn by visiting Epic Condition's show highlights page (link above) - click on the "Ice Climbing in Ouray" show highlight. 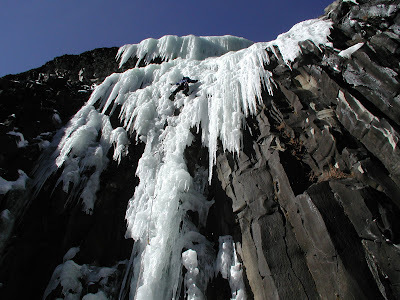 Dawn will be guiding in Ouray this winter, so if you are interested in learning to ice climb or to refine your ice skills, call us at 800-424-2249 to schedule a day or two. You can also email Coley Gentzel (cgentzel@aai.cc) to book. YES!! This show is so great. Who even knew that the Weather Channel had actual programming?? That "...Good Looking One" route looked intense, some awesome footage. That ice looks beautiful, but dangerous! !